High End performance at an unbeatable price! The load capacity is adaptable in the range of 1-5kg/foot. Inclusion of additional compression-springs (optional) increase the maximum load capacity to 11kg/foot. Isoblack the world’s third best passive isolator? 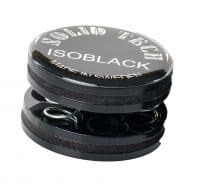 Isoblack is our most versatile and still high-performance isolator at an unbeatable price. Isoblack consists of two halves with an intermediate isolation-layer. Each half consists of two black precision laser-cut high-gloss Acrylic discs with an intermediate damping layer that suppress the compression-spring’s ringing properties. One half has a logo with anti-slide properties. 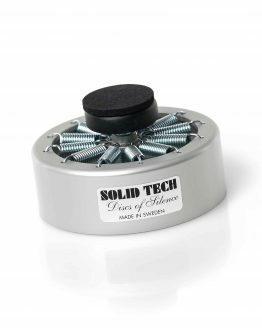 The isolation-layer consists of compression-springs of highest industrial quality. The compression-springs allow high freedom of movement in all planes, a prerequisite for good isolation characteristics. Optimal isolation characteristics and height adjustment is achieved easily through adjustment of the number of compression-springs in each isolator. Correctly adapted and loaded is the resonance frequency well below 4Hz. Ensuring isolation even in the lowest and most degrading frequencies, resulting in much higher fidelity without tonal highlighting and masking such as more dynamic, cleaner transient response, wider and deeper soundstage, increased low level information, tighter bass and silkier highs. 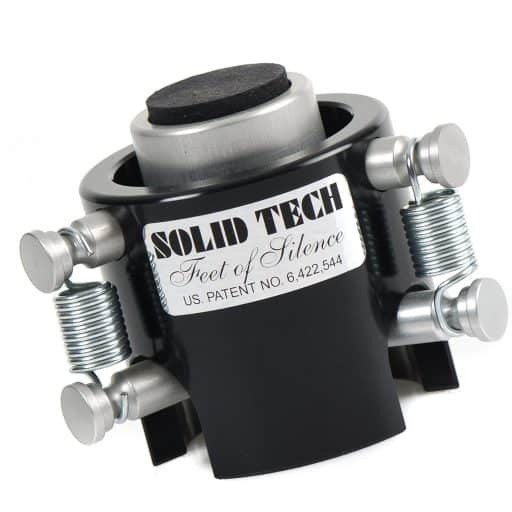 Upon delivery, each isolator is equipped with 3 compression-springs plus one 50% capacity compression-spring for fine leveling.This corresponds to a load-capacity of approx. 5 kg (11lbs) per isolator. If there is a need for more load-capacity, could up to four more compression-springs be added, increasing load-capacity to approx. 11 kg (24lbs) per isolator. Properly adapted is the working height 22-23mm. The diameter is less than 50mm. The free placement possibilities mean that the resonances emitted from the component’s chassis can be tuned to a more desirable frequency. Isoblack is an isolator for seasoned audiophiles and music lovers, not for insecure audiophiles with a need to assert themselves with a high price and voodoo properties. Have you ever seen an independently conducted vibration measurement and analysis from any other passive audio-isolator manufacturer? Regardless of the price, of course. Please feel free to compare with other products costing five or ten times as much. If you have we are willing to include a link below for comparison.